This 5lb box will do a 40lb. bag of crawfish with enough left over to sprinkle over top of cooked crawfish. Seasoning contains: salt, maitodextrin, spices, dehydrated garlic & onion, monosodium glutamate, extractice of red pepper & natural flavoring. For "Spicy" flavor use 1lb. of seasoning to 10lb. of crawfish or 15lb. of shrimp or 2 dozen crabs. 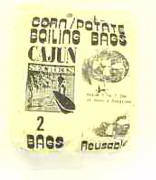 Corn Boiling Bag 12"x 18"
This package of Gumbo Seasoning contains: salt, dehydrated onion, flavorings, dehydrated parsley, bell pepper, & garlic. Use this 3oz package for 5lb. of mixed seafood, add more seasoning for spicer flavor. These crab tongs are perfect for getting the crabs out of the pot!! This 18 inch Stainless Steel Roux Spoon is a great tool to help you thicken those stews, jambalayas, and etoufees. Flat edge to help scrap the bottom of your pot. Serving Spoon is great for working the pan surface or handing out adequate sized servings on buffet or serving lines of many menu items. 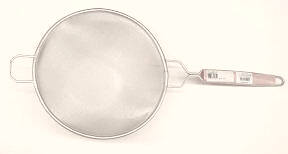 Great tool for scooping up fried foods or straining your grease. 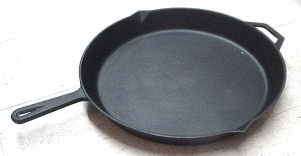 Great for pulling food out of the fryer or straining grease. 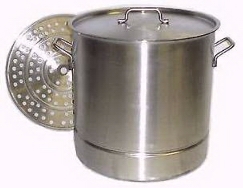 Use this Alum Stockpot to Steam Tamales and or Seafood. This 16-qt steamer also includes a perforated metal divider insert that sits at the bottom to keep food out of the water. This rack can be used for steaming vegetables, tamales and a variety of seafood such as crabs, crab legs, lobster, shrimp and mussels. 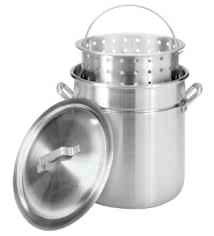 22 quart heavy duty stainless steel construction with stainless steel lid and heavy duty punched Stainless Steel basket. Heavy duty stainless steel construction for optimal durability. For straining grease or pulling food out of the fryer. Good for straining grease or pulling fried foods out of the fryer. Has a vented lid for even cooking. The heavy duty riveted handles Commercial-strength 99 percen. It is pure aluminum construction. Perforated basket mounts 2 inches from bottom of pot. Basket detaches for boiling pasta, soups, stews, gumbo, crawfish, etc. Enjoy a great family meal cooked in this! Perfect for indoor or outdoor cooking. Made to be heavy-duty, rough and rugged. Perfect for roasting chicken, ham and pot roast, fry fish, chicken and hushpuppies. You can also bake cornbread and biscuits.Sized perfectly for most cooking needs. 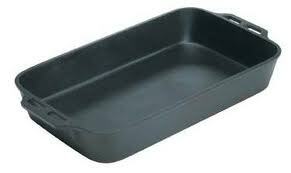 Also features small handles on each side of the cast iron baking pan to help with picking it up. It is pre-seasoned and it is 3.5" deep, 14.5" wide and 32" long. This jambalaya pot is a high quality jambalaya pot. 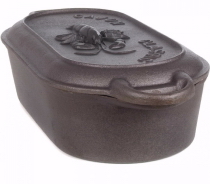 Use this jambalaya pot for cooking on an outdoor burner on over a camp fire. Most Cajuns use these pots to cook large amounts of jambalaya, gumbo, chili and more. 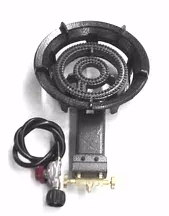 This is a extra large cast iron burner with windshield and dual control, one for the inner ring and one for the outer ring. Outer ring of the burner is about 8.5" in diameter and the smaller ring is 4" diameter. Comes with high pressure regulator and hose! For your heavy duty large pots!!! 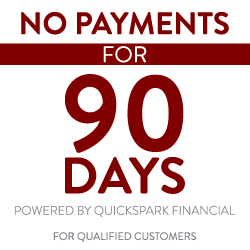 Includes low pressure Burner and 20 inch Skillet. For Fun Cooking for large groups!